If you are swimming laps, make sure you are using the earbuds designed for submersion. If you purchased Swimbuds, by themselves or in a bundle, these are the white headphones. They are designed to create a seal in your ear while the other earbuds are designed to stay on your head when out of the water. Visit the specific headphone pages linked in on the previous page to see instructions on how to fit the headphones. Check the iPod with a different set of headphones to make sure that it’s the headphones, not the iPod. You can also check the headphones with another device to see if they work. 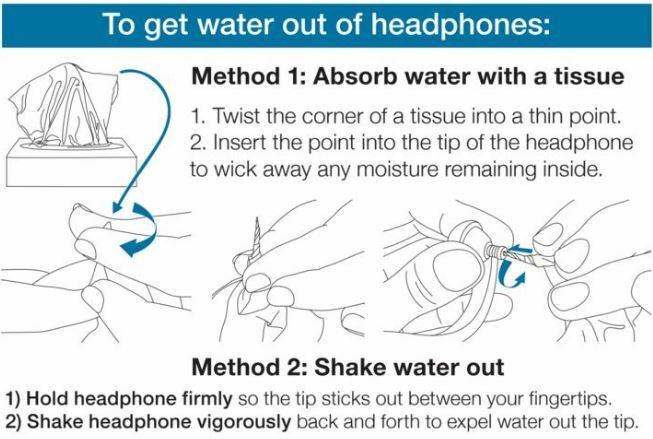 Remove the soft rubber earbud from the headphones. Roll a napkin or facial tissue to form a small tip. Stick the napkin or facial tissue into the hole of the hard plastic earpiece of the headphones to absorb any water that may be inside. Replace the soft rubber earbud and test the sound quality. Check the headphone jack on the Shuffle for debris and gently remove any you find with a toothpick. Debris in the headphone jack (lint, etc) will prevent a connection between the iPod and the headphones. Underwater Audio headphones are waterproof, they are not indestructible. Here are some tips to get the best, longest use out of your headphones. Avoid extreme high and low temperatures. While removing headphones from a device pull on the plug rather than the cord. Rinse with clean water and pat dry after each use. Store in a clean, dry location between uses. A great option is the carrying case we provide with the Swimbuds Sport, HydroActive, or Flex headphones. Gently wrap cord between uses, avoiding right angle kinks.